After setting up a call center for the first time or upgrading to a new version of the managed package, set the values for any call center settings. The managed package that you installed contains two different call center definition files: one for Salesforce Classic (PureCloud for Salesforce) and one for Lightning Experience (PureCloud for Salesforce Lightning). For information about setup and limitations with Lightning Experience, see Salesforce Lightning Experience. Auto Redirect to SSO allows you to use a single sign-on identity provider. By using a single sign-on identity provider, an agent can sign in to one application such as Salesforce and then is automatically logged in to the client. For information about the single sign-on providers that PureCloud supports, see About single sign-on (SSO). If you select Auto Redirect to SSO, all agents in your organization must use the single sign-on identity provider that you input. For agents that do not use this single sign-on identity provider, create a separate call center definition and assign those agents to the new call center definition. For more information about creating a separate call center definition, see Use different configurations for different agents. In the SSO Identity Provider Name box, input the name of the single sign-on identity provider that you want to use. In the PureCloud Organization Name box, input the name of the PureCloud organization that uses this single sign-on identity provider. Note: If your single sign-on identity provider does not allow the single sign-on redirect window to be embedded, then select Enable Dedicated Login Window. Otherwise, when you log in, the client will not load. Instead, you see a blank area on-screen and an error message in the console. Enable Dedicated Login Window allows you to use login providers that do not work in embedded windows. This setting causes a separate login window to open. If you close this window, you can reopen it by clicking Open Authentication Window in the client. In this window, you sign-in using PureCloud credentials or credentials for other providers that you configured in your PureCloud organization. To direct all agents to a single provider, use this setting with the Auto Redirect to SSO. For information about the single sign-on providers that PureCloud supports, see About single sign-on (SSO). Enable Auto Association on Navigation associates the current Salesforce record automatically with the interaction’s log as agents navigate. Note: You cannot select both Enable Auto Association on Navigation and Enable Tab/Interaction Sync. Enable Tab/Interaction Sync syncs primary tabs in Salesforce with interactions in the client. When you click a primary tab in Salesforce, the integration switches to the corresponding interaction in the client. When you click an interaction in the client, the integration switches to the corresponding primary tab in Salesforce. The integration first searches Salesforce for the data in the Name field in the client. If the integration cannot find a match in Salesforce, the integration searches Salesforce for the data in the Related To field. For more information, see Interaction logs and Synchronize interaction attributes with Salesforce activity records. This feature is only available in Salesforce console apps in either Classic (Service Cloud) or Lightning Experience. You cannot select both Enable Tab/Interaction Sync and Enable Auto Association on Navigation. Enable Interaction Logs provides access to the interaction logs from the client. This setting is selected by default. For more information, see Interaction logs. Enable Interaction Log Editing allows agents to write and edit interaction logs in the client. This setting is selected by default. Tip for Internet Explorer users: Clear the Enable Interaction Log Editing setting. Internet Explorer has problems saving the interaction log when multiple browser tabs or windows are open. Clearing this setting prevents any edits to the interaction log. If you clear Enable Interaction Log Editing, the integration initially creates an activity record in Salesforce when an agent picks up an interaction. However, the integration does not update the record during or after the interaction. As a result, the integration does not save data that is only available during or after the interaction, such as duration or wrap-up codes, to Salesforce. For more information, see View and edit interaction logs. You can cause a Notes section to appear in the Wrap-up window by clearing this setting. For more information, see Wrap up an interaction. Enable Workspace Transfers allows agents to transfer tabs when they transfer a call. The integration transfers the main tab that the agent is viewing and any subtabs for that record that the agent has open. This setting is selected by default. For more information, see Workspace transfers and Screen pop. Embed Interaction Window enables an embedded interaction window. By default, scripts, chats, emails, and messages open in a separate window. You can configure Salesforce to show scripts, chats, emails, and messages in an embedded interaction window in Classic (Service Cloud) and Lightning Experience. If you select Embed Interaction Window, be sure to add an embedded interaction window. Enable Server-Side Logging enables logging that Customer Care can access. By default, logs appear in your browser console that you can use to troubleshoot issues. 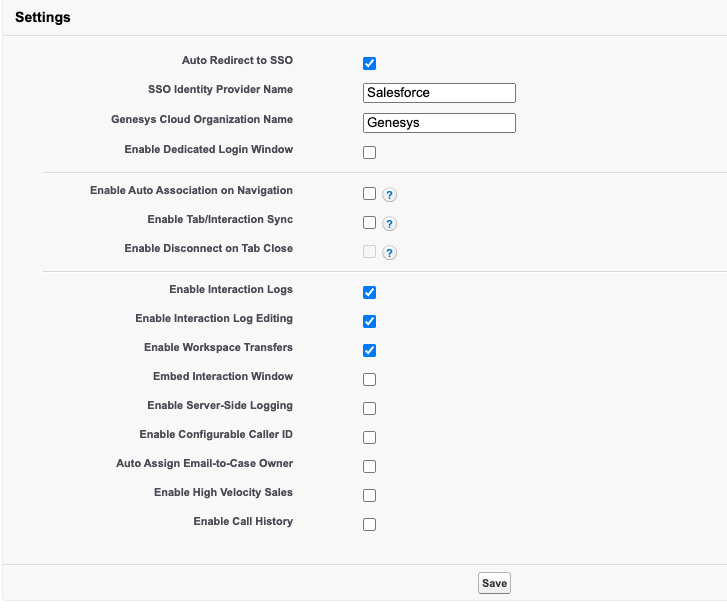 You can also configure PureCloud for Salesforce to save logs server side by selecting Enable Server-Side Logging. Customer Care can then access these logs directly, eliminating the need for you to send them. Tip: If you have a slow or unreliable Internet connection, or you risk running out of session storage, Genesys recommends that you do not select Enable Server-Side Logging. Enable Configurable Caller ID enables caller ID for outbound calls. This setting causes caller ID name and number boxes to appear in the client when agents make calls. The names and phone numbers that agents input appear to recipients of outbound calls. After enabling this setting, configure Calling for your external trunk in your PureCloud organization. For more information, see Configure caller ID. Enable Client Events enables events in Lightning Experience. This setting causes an event to fire whenever the client is loaded. You can also configure the integration to fire Interaction, Notification, or UserAction events. Select one or more of these events under Available and click the right arrow to move them under Chosen. Developers need to add a Lightning component to Salesforce to receive or send these events. For more information, see Events in Salesforce. Note: If you select Enable Client Events in the call center settings, agents will not be able to detach the client from the browser window. For more information, see Access the client.